What Nutrients Does Kiwi Fruit Have? Kiwi fruit was originally grown in the Chang Kiang Valley of China around the 10th century. By the mid-1800s, kiwi fruit had made its way into other countries and had gained popularity. Originally called a Chinese Gooseberry, kiwi fruit was renamed because American importers and grocers thought this fruit resembled the fuzzy brown kiwi, which is the national bird of New Zealand. Kiwi fruit is loaded with nutrition and is a favorite exotic fruit for many people. 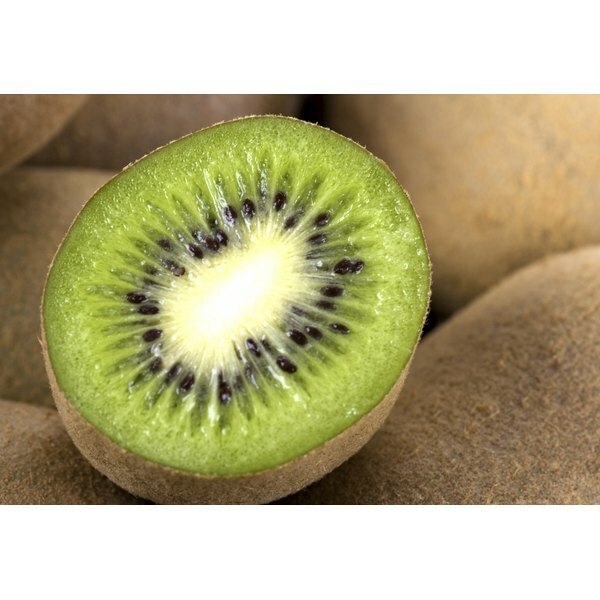 Though kiwi fruit consists of about 83 percent water, it is packed with nutrition. High in vitamin C, vitamin K, dietary fiber and essentially fat free, these fuzzy fruits taste good and are good for you. Kiwi fruit is also antioxidant rich. Antioxidants help to reduce risk of cancer, heart disease and stroke. It is grown in many regions around the globe, and can generally be found during most seasons. A one-cup serving of kiwi fruit contains roughly 166 milligrams of vitamin C, or about 278 percent of the daily value for vitamin C. In comparison, a similar serving size of apples contains only about 4 milligrams of vitamin C. An antioxidant, vitamin C, is linked to lower risk of cancers, cardiovascular disease, macular degeneration, and possibly, the common cold. A one-cup serving of kiwi fruit contains about 5 grams of fiber. This is about twice the fiber in a one-cup serving of peaches. An indigestible carbohydrate, fiber has been proven to regulate blood sugar, lower the risk of heart disease, decrease the risk of diabetes and promote bowel health and regularity. Kiwi fruit is also packed with vitamin K. A one-cup serving will get you about 90 percent of the daily value for vitamin K, or about 72 micrograms. Vitamin K is crucial for blood clotting, and recent research indicates that it is an important part of bone building and bone health. Adequate vitamin K intake reduces the risk of bone fractures and increases bone-mineral density. The health benefits and nutritional value of kiwi fruits is clear; grab one of these healthy, fuzzy fruits and enjoy its bounty.